Marlene was a people person and had a big heart and a caring soul. Her love for her husband and soul mate Frank was unconditional. She was a proud Aunt to her nieces Heather (Mike) and Kelly (Kevin) and her nephew Jim (Anna). She enjoyed her great-nieces Bella and Paige and her nephews Christian and Jason. 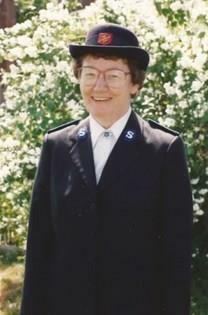 Marlene devoted much of her time to the Salvation Army East Toronto Corps. She was a remarkable woman. May her faith in God, her loving smile and her zest for life remain in our hearts forever. Visitations will be held on Wednesday, January 10th from 2-4 and 6-8 p.m. at Giffen-Mack Funeral Home at 2570 Danforth Avenue, Toronto. A celebration of her life will be followed on Thursday, January 11th at 11:00 a.m. at The Salvation Army, 107 Cedarvale Avenue, Toronto. In lieu of flowers, donations may be made to The Salvation Army East Toronto.